The fact that Tim Burton was going to direct a film version of Alice in Wonderland has been on my radar for quit sometime now and I've managed to find some sneaky peek pics on the internet. I must say, I'm a little disappointed with Alice's outfit - I was expecting/hoping for something more Gwen Stefani like. Also the dress underneath reminds me of the cut out jeans from House of Holland's latest collection - thats never a good thing right? 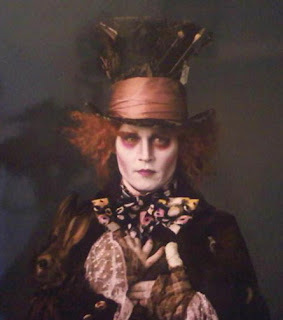 But apparently, this is an early make-up/costume test for Johnny Depp as the Mad Hatter, which is more like it but don't quote me on that! This new Aussie actress called Mia Wasikowska. Matt Lucas is going to play Tweedledee and Tweedledum - amazing.